Amazon’s Athena database supports a wide array of geospatial functionality that allows for building complex analysis with any data containing geographies or individual locations. With Looker, you can query data directly from Athena and leverage all of their geospatial functionality to give users the ability to work with massive geospatial data sets. A particularly powerful geospatial data set that is available to the public is OpenStreetMap data. Since this data is available in a public S3 bucket, you’ll be able to very easily pull this data into Athena and start querying it. While it’ll be easy to get up and running right away running basic SELECT queries, the complex structure of the dataset means that writing manual SQL queries every time you have a new question is going to be a challenge. This is where combining Athena’s geospatial functionality with Looker’s LookML modeling layer becomes incredibly powerful. 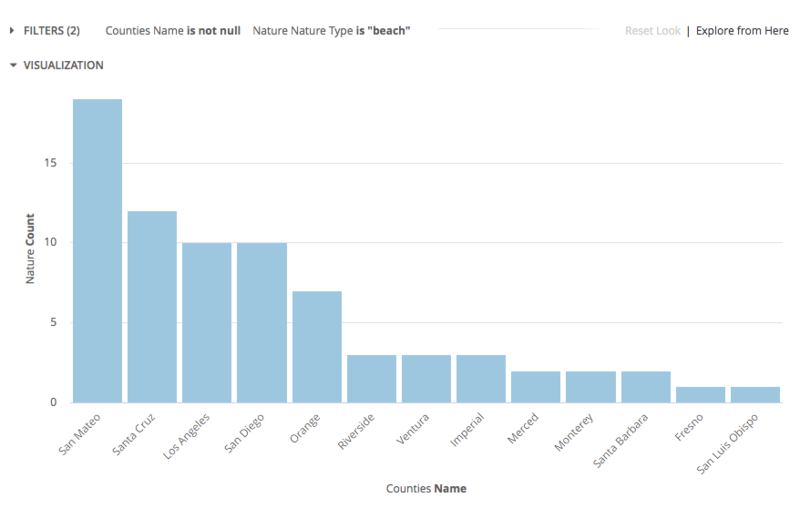 To demonstrate some of this functionality, I thought it would be interesting to explore the natural environment of Southern California by county. In order to compare which county has the most “Nature”, I loaded up the boundaryshapes of each SoCal county into Athena. The boundary shape field can be read as a type ‘Polygon’ in Athena and represents a set of points. To limit the OpenStreetMap data down to just its natural elements and improve query performance, we can focus our dataset by creating a Derived Table in Looker to shrink the data set considerably. Since our nature data is highly nested, we can use Athena’s un-nesting functions to parse out the details about each point of interest and codify that logic in LookML. 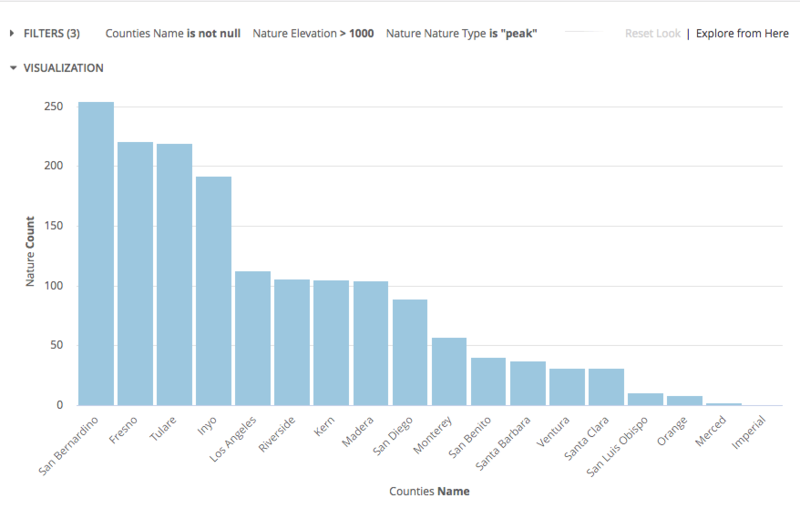 description: "Nature Type as Defined by OpenStreetMaps"
San Bernardino County, not surprisingly, contains the most peaks over 1000 feet in elevation. Drilling into this data, I found that the highest peak in San Bernardino is San Gorgonio Mountain at 3,502’. Say you were interested in planning a hiking vacation in California, an important decision for your trip will be picking a hotel that is closest to the highest peaks you intend to climb. Luckily, we can pull hotel information from OpenStreetMap by filtering our data on WHERE tags['tourism'] = 'hotel'. In Athena, I used the ST_BUFFER() function to find the natural elements nearby each hotel in the data set. Using LookML, you can create a metric that will allow you to count only the natural elements that have peaks greater than 1000 feet high. Then, we could use Looker’s explore section to build a query that counts the number of high peaks within a short drive from each hotel. 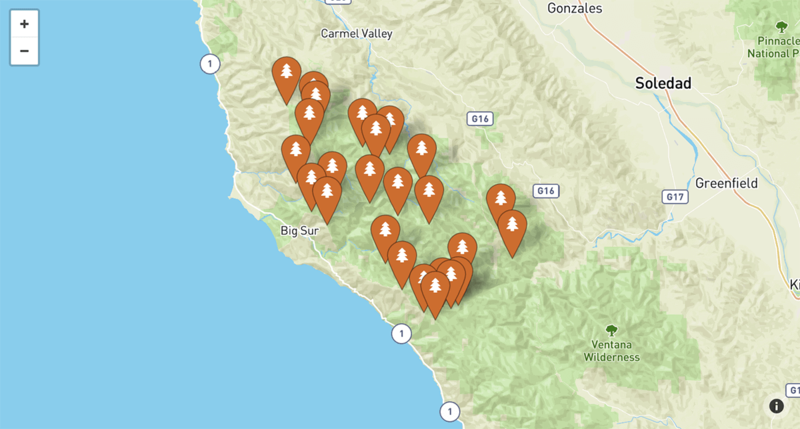 It turns out that one region in California in particular, the Big Sur area, offers 4 hotels that are each within a short drive of over 20 high peaks. 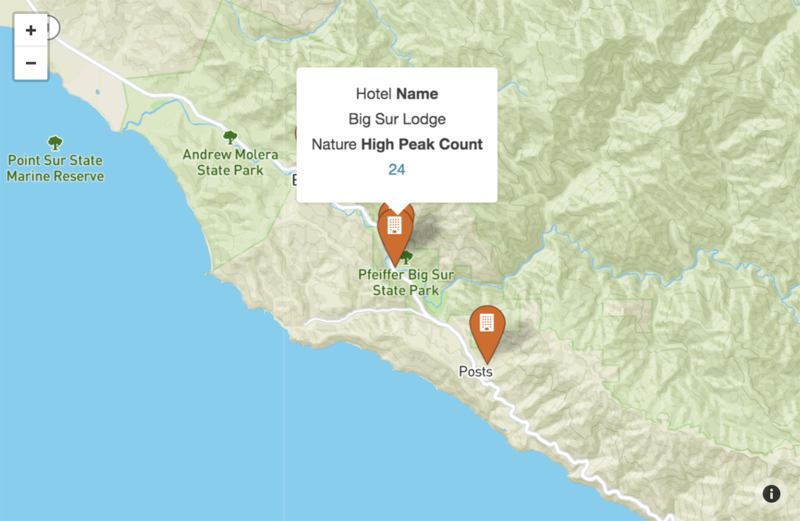 The Big Sur Lodge seems like it might be a great place to take a hiking vacation. We can drill into the count of high peaks and plot the exact locations of each peak. Geospatial datasets like OpenStreetMap can help users answer many important and challenging questions about our environment. However, historically, geospatial data was notoriously cumbersome and clunky to work with. Data scientists were always required to meticulously transform the data for every new question asked by a non-technical user. Now, with a combination of Amazon Athena’s geospatial functionality and LookML, analysts can create an environment that enables non-technical end users to explore these types of data sets and answer questions on their own.